a. Song is transcribed in musical notation, for piano and with guitar chords, and containing lyrics to all verses in Spanish and English. b. 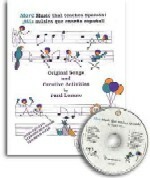 Teaching suggestions introduce and describe many creative games and activities to incorporate and extend the song in lesson plans. c. Song appears in an illustrated format, so that students can follow the content of the song by recognizing the vocabulary via drawings. You may duplicate this page so that all students have their own copy! d. Creative hands-on activities for each song, all designed to reinforce the vocabulary and structures presented in the particular selection, including templates, flashcards, worksheets, game boards, drawing projects and more!